Happy Freebie Friday! It’s Friday, so welcome back to another Freebie Friday. Today’s freebie is associated with our game Fish Lake and it is a photo of Ojibwa camp life. More specifically, the photo depicts an elderly Indian woman outside of a teepee that has poles in front of it that are being used to dry fish. It’s a photo that gives a real glimpse into the Ojibwa camp life. Photos like these are a great resource to supplement our game Fish Lake because it really brings the game to life. This photo and others can be found on our Fish Lake Photos website page. There you can find great photos of Native American life provided by the Library of Congress website. 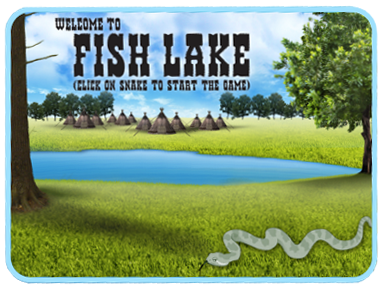 So feel free to head over to our Fish Lake Photos page and the Library of Congress website to find more Native American life photos to use at home or in your classroom. See you next week for another Freebie Friday! If you like this post, you’ll really like this game. Check that out, too. ← Throwback Thursday: Which meet-ups are worth your time?